Since you cannot become a Buddha merely by understanding Dharma, practice earnestly with understanding. Because you have received advice, whenever you are not meditating always practice in accordance with what your Spiritual Guide says. If you practice with great devotion, results will arise immediately, without your having to wait for a long time. If from your heart you practice in accordance with Dharma, both food and resources will come naturally to hand. Friends, the things you desire give no more satisfaction than drinking sea water, therefore practice contentment. Do not be jealous of others' good qualities, but out of admiration adopt them yourself. Distracting enjoyments have no essence, therefore sincerely practice giving. Since this human life is wasted by indulging in distractions, now is the time to practice concentration. If you practice like this you will delight me, and you will bring happiness to yourself and others. 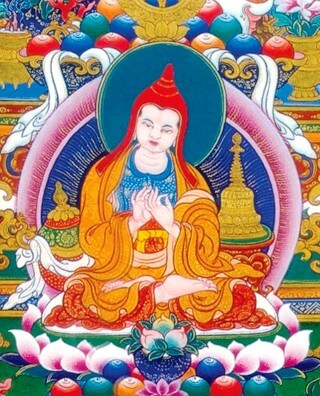 This is the advice that the holy being Venerable Atisha gave to Venerable Jangchub �." Translation by Geshe Kelsang Gyatso. "You should know that beings are of three kinds-- Those of lesser, intermediate and supreme capacity." "The best guru is one who attacks your hidden faults The best instructions are the ones that target those faults."